Tennis court resurfacing & repair in St Louis is available through SportMaster and our local tennis court contractors. Does your tennis court surface look faded and worn, or are the cracks and puddles getting worse? Fill out the contact form on this page and we will provide you will experienced tennis court resurfacing contractors in St Louis. How much does it cost to resurface a tennis court in St Louis? Acrylic Resurfacer should be used on new courts and on existing acrylic courts, prior to color coating. Two coats of Acrylic Resurfacer is recommended on new tennis court surfaces to fill the voids in asphalt. This will help to prevent pinholes and maximize coverage in the color coatings. One coat of Acrylic Resurfacer is usually sufficient on an existing court. It will re-texture the smooth surface and ensure consistent application of the color coatings. After the Acrylic Resurfacer is applied and completely dry and cured, it is time to apply the colored tennis court surfaces. After laying out the tennis court lines, the final step is striping. 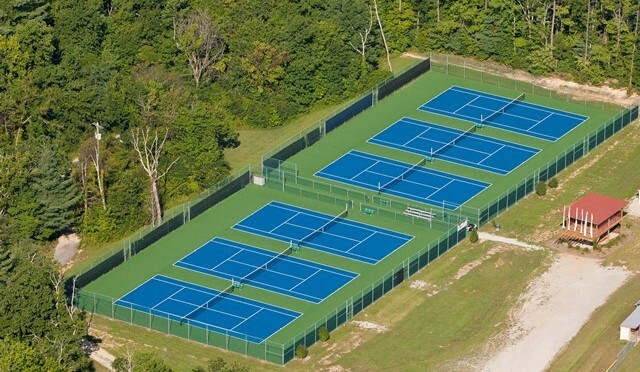 Our St Louis-based tennis court resurfacing contractors can also paint blended lines on the tennis court for pickleball, kids tennis, basketball, and many other sports.